Does stubbornness run in your family? If you are seeing it in your child, you might think they got it from you. Each time I am asked what to do about a stubborn child, my answer is the same: SAY WHAT YOU SEE®. Stubborn is one of those things that we are sure we "see," but is not really happening. However, it is what we are thinking. The descriptive nature of SAY WHAT YOU SEE gets you out of your head into the moment, so you can see what actually is happening. SWYS: "Your arms are crossed, and you are not budging." 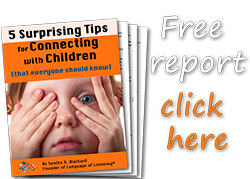 When you say what you see in a judgment-free manner, your child will have the space to respond. 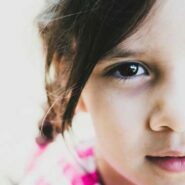 Even if at first your voice is full of frustration, say it again with more curiosity this time, because as soon as it sounds non-judgmental, the child will answer. We all have every possible inner strength; and we act according to who we believe we are. The trick is in seeing our actions and our child's through the lens of STRENGTHs. The dictionary describes "stubborn" as "unyielding," which is why it shows up like a power battle. Unyielding is a fighting word, words define our beliefs, our beliefs shape our actions. "Unyielding" and "perseverance" also suggest that in a "stubborn" moment there is something really important to fight for; something that the child (and you) don't want to give up, and actually can't. That thing is being heard. Everything we do and say is a communication; and we must continue to communicate until we are heard. That's why Language of Listening® changes everything. When you understand the importance of being heard, you can use our simple coaching skills (SAY WHAT YOU SEE, STRENGTHs, CAN DOs) to change what feels like an inherited wall of stubbornness into a pathway to connection. Say what the child wants before offering a CAN DO. When any of us don't feel heard, what hasn't been heard or validated is usually something we want. We identify with what we want. When what we want is discounted, we feel like we are discounted, because what we want and consider important is an expression of our very self. That's why validating what children want, even if they can't have it, creates connection and opens the door for cooperation. They feel heard. Child: "I'm not going. I want to stay home." SWYS: "You want to stay home." Child: "I don't want to leave my puppy. He'll be sad." SWYS: "Your puppy's feelings are important to you, and it sounds like you know he can't come along. No wonder you don't want to go!" CAN DO: "Hmm. You want him to be happy, you have to go, and he has to stay home. That is a problem! Hmm. Must be something you can do, so he's entertained while we are gone." STRENGTH: "You gave him all of his toys and filled his water bowl. You know how to take care of your puppy. Now he'll be happy!" What stubborn really means is this: someone has not been heard. While stubbornness does not run in families, not being heard can. With our simple coaching skills and your perseverance (good thing you never gave it up! ), you can start a new tradition of getting your family heard right now. This was very helpful. I can’t wait to try it out. You sound excited about trying this. I hope you will let me know how it goes. Very helpful— thank you! Do you have a cheat sheet / printable I could hang on my wall, by any chance? Noelle, you just gave me an idea! Currently, the last page of the printed SAY WHAT YOU SEE® handbook has a tear sheet of the Heart Model and Premises just for that purpose: https://tinyurl.com/SWYSAmazon and a downloadable color version of it is included in the Online Training Center: https://www.languageoflistening.com/classes/online-training-registration . Thanks to your interest, I just added an updated version as a bonus printable for signing up for my newsletter: https://www.languageoflistening.com/resources/newsletter-signup . I hope you find it helpful.